I am the proud new owner of an Accuquilt Go! Baby Fabric Cutter. Aren’t you jealous? I have wanted one of these since I first saw it on a blog ages ago. I mean really, what better tool could someone like me, who does quilting and applique all the time, need? What’s the first thing I made with it? A cute and festive applique pillow! And as the kids sing it, they ‘grow’ tall and then slowly melt to the floor. It is currently my 18 month old’s favorite song and he giggles like crazy when we sing it and do the actions. So I thought it would be fun to make it into a pillow! It’s SUPER easy. You have to have 1) the cutter, 2) a die–I used a snowman die and the three circles die, 3) The plastic cutting mat thingy, and 4) fabric! Step 1: If you are going to be doing applique, make sure that the fabric is already backed with adhesive Wonder Under type stuff. Put the fabric over the shape that you want cut out. You can do one at a time or multiple. I think the most I cut at a time was 4 but you can test it out to see what works best. I found that it actually cut better sometimes if there were more layers of fabric. 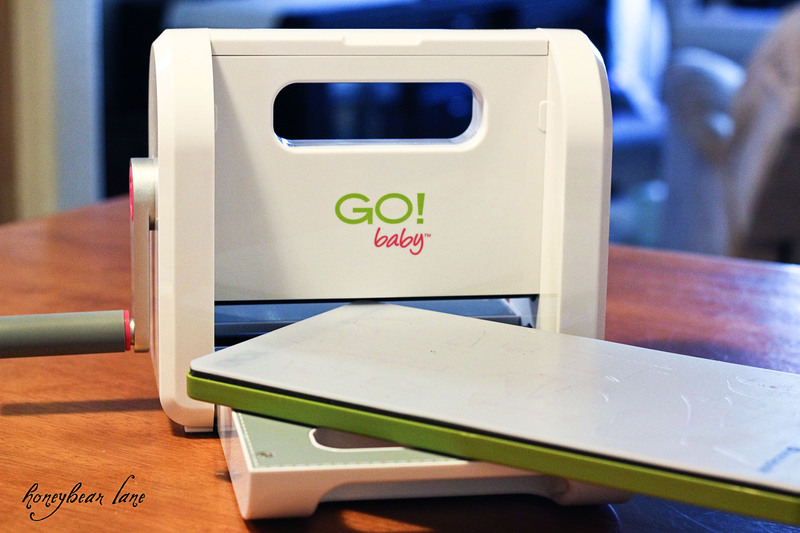 Step 2: Then you put the cutter mat on top and feed it through the Go! Baby Cutter, cranking the handle in the direction you want to feed it. Out it will come on the other side, perfectly cut and ready to go! You can do several shapes at a time in different fabrics. I LOVE that you don’t have to plug this in or hook it up to anything to get it to work. I love all my electronic doohickeys but sometimes it’s so nice to not have to worry about an outlet or whatever. And I LOVE that you literally just need a few items to cut fabric into these cool shapes! It takes seconds and saves SO much time. What can I say, I am in love. And did you further know that if you sign up for their newsletter, you get 22 FREE patterns! I mean really, how awesome is that. 1. After I cut out all my shapes, I arranged them how I wanted on two rectangle pieces of white canvas (remember how I have like yards and yards of white canvas leftover from my slipcover?) For the melting snowman I free-hand cut my bottom circle all wiggly so it was like melting snow. I ironed it on. 2. Then I used the blanket stitch setting to applique all around the snowmen. Check out my tutorial on how to applique. 3. I made a freezer paper stencil with my Silhouette to make the words and painted them green. 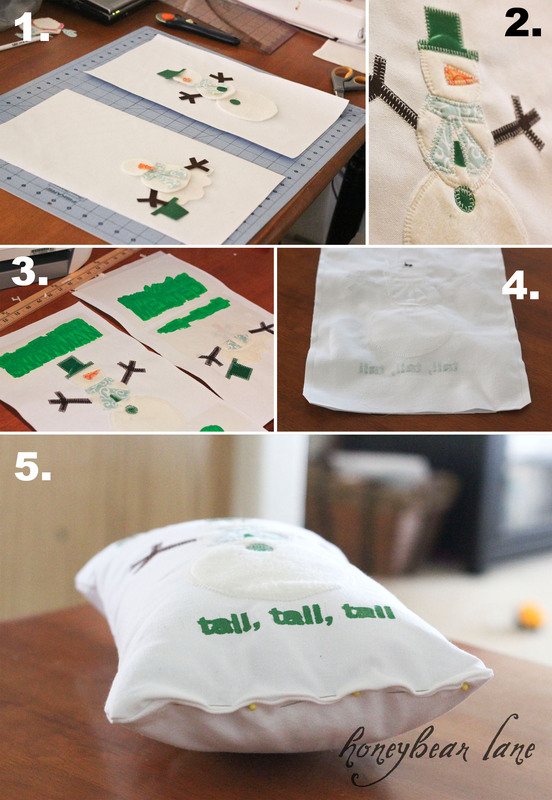 Here’s a great tutorial on stenciling with freezer paper. Skip to the end of the post for some great tips on cutting freezer paper with your Silhouette! 4. After I hand stitched in some eyes really quick, I put right sides together and just sewed all around, leaving a gap at the bottom so I could turn it inside out and stuff it. I also clipped the corners. 5. I put in the pillow form I made (Make Your Own Pillow Form Here) and then slipstitched the bottom closed. Whew! Did you get all that? Lots of techniques there. It should be like a Crafting 101 Final Project. I love my cute little winter pillow! And I love my Accuquilt Go! Baby Fabric Cutter. The End. It took me FOREVER to figure out the best way to successfully make a freezer paper stencil, one that has small details like words. 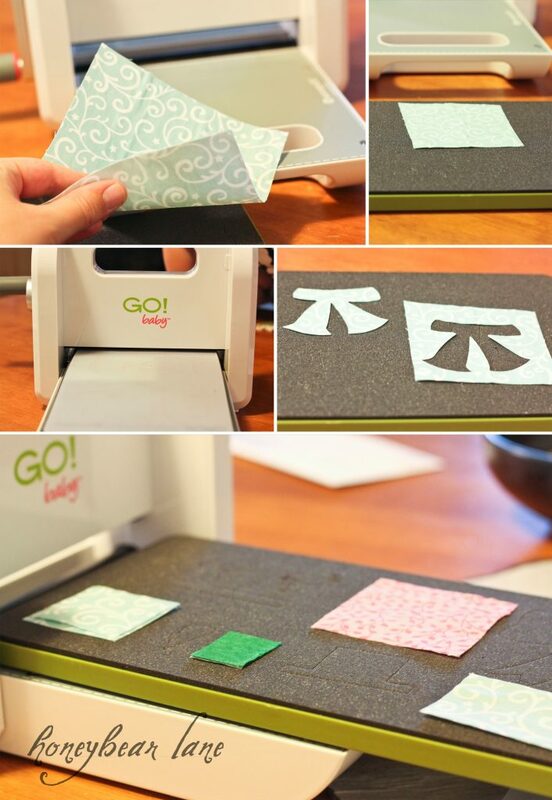 First of all, read this post on Cutting Freezer Paper with your Silhouette. This helped SO much. My own tip is that you should place your image in the middle of the page. I used to try to put it at the top to save product, but if you put it in the middle, the freezer paper will have much less tendency to to bunch up and get mangled. Make sure it’s on the vellum cutting setting and the shiny side is up with your text mirror imaged. Much higher rate of success if you use these tips! 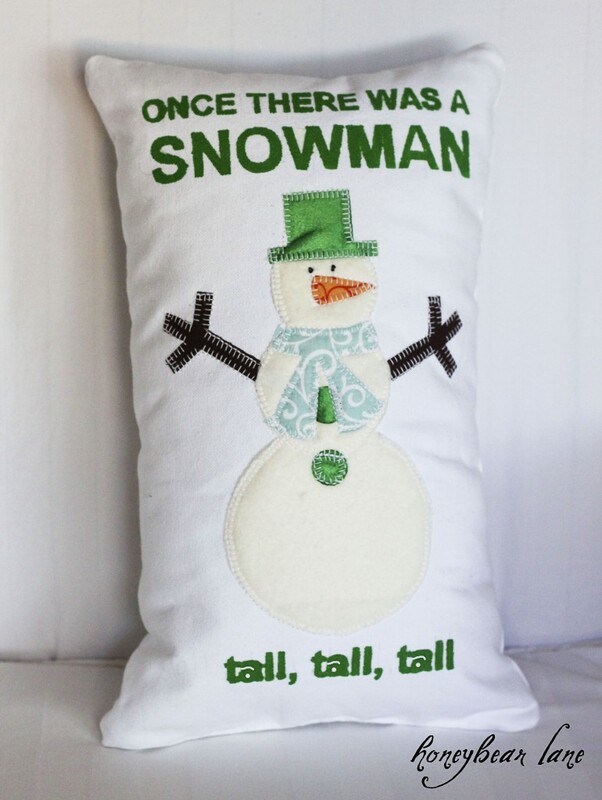 This is the cutest Christmas pillow I have EVER seen! I love it! THANK YOU for the tutorial! Great job!!! So glad you like it Becca! Love it…… a very cute pillow indeed! I love this pillow! It’s the cutest thing I have ever seen! I used the Go baby to make a one of your puff quilts and it saved so much time! Now I might need a snowman die. Very cute! Thanks so much! That’s awesome! I got the 5×5 die also and I’m so excited to use it for quilting! Wow, the machine looks awesome!!! How much are they? Love the pillow, very cute! 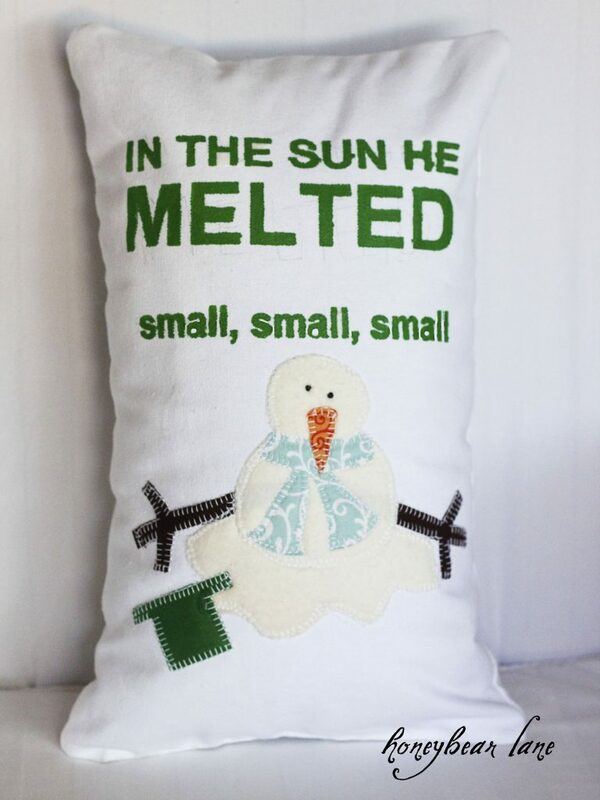 My little girl loves that song, so she would love a pillow like that. Good job! That is so STINKIN cute! OMG, you are so talented! WOW! Love it! Now I’m wondering if my cricut machine would cute fabric like that too. Maybe if I had a deep cut blade. hmmm You’ve given me a lot to think about, thanx!!!! Hello! I love this – it is so cute and I now want to something with it for my grand-daughters! Sweet! Thanks for visiting Robin! 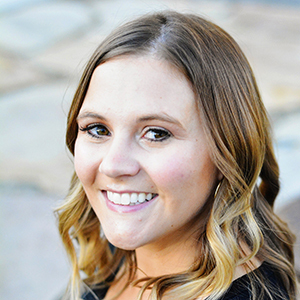 Your site is super cute!